Today I had been running around all day to prepare for the upcoming school year. Errands and appointments, one right after the next. When I finally got home, I looked around and was surprised by the state of the house. I don’t remember leaving it that way. There were things everywhere. I had just about 20 minutes to frantically clean up before a friend of mine was coming over to visit. That awesome little saying “If you’re coming to see me, stop by any time. If you’re coming to see my house, make an appointment” never rings true for me. I don’t want my house to be messy. I know that if my house is messy when my friend comes over, I will spend the entire time apologizing for everything being everywhere and the dirty dishes in the sink and not thoroughly enjoy the visit. I am just being honest. I know it shouldn’t be that way…that’s just how I am wired. Even if it is just a graceful sweep through the areas we will be in I will feel a sense of peace. I enlisted the help of my daughter to do the quick pick up with me. While we were dashing back and forth past each other she turned to me and said “Mom, we have such a pretty house. Why doesn’t it look like this all the time?” “I don’t know”, I replied. #momguilt #reallife When my kids were babies and littles, it was really hard!! My house sometimes looked how I looked and felt; messy and like I had regurgitated my own self. But, that was the season. It is a little better now, as the kids have gotten older, but I still have those days. I know we are all busy and running in what seems to be a million different directions. But taking a few minutes to make something lovely by doing a quick clean up is rejuvenating and brings peace in its own little way. I quickly unloaded the dishwasher and reloaded it, added oils to my diffuser to make the house smell divine, lit a candle (because lit candles are like a maxi dress…it looks like you made a huge effort even though you didn’t), placed all of the shoes in the mudroom, ran my Dyson Cordless Vacuum through, put things back where they belonged and, when my friend walked up to the door, the house looked and smelled amazing. 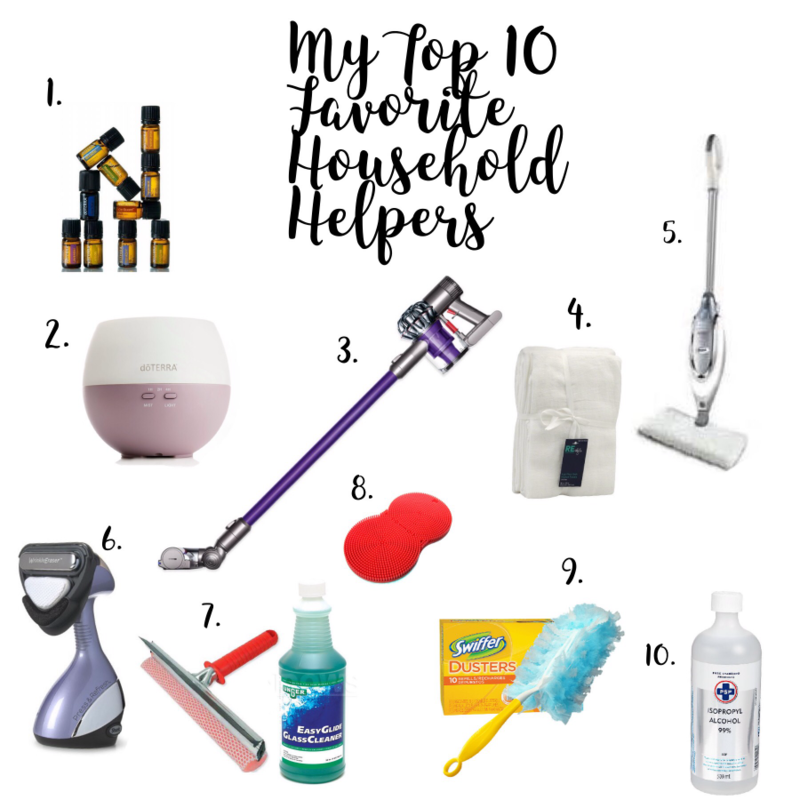 I have put together a list of my 10 favorite household helpers that I use ALL the time. To try to keep up with the house, I incorporate most of these things in some way every day. At the top of my list is 1 // Essential oils. I use them every day in so many ways. Aside from their health benefits, they are fabulous to clean with. I use them in a variety of ways including freshen the air, wipe down the counters, and shine my stainless steel. One of my favorite ways to use oils is to simply put a few drops of lemon oil on a flour sack to clean and shine stainless steel. Not only does it have a fresh, clean scent, but it is also antiseptic, antifungal, and antiviral. Lemon is an air disinfectant and is invigorating and energizing! 2 // Essential oil diffuser. I use this every day with different oils depending on what is happening during the day. In the morning, while the coffee is brewing, I turn it on and add orange and peppermint. It’s great to wake the house up! If I have been cooking I use Doterra’s Purify to help with odors and other impurities in the air. Purify contains Lemon, Lime, and Pine essential oils, known for their powerful cleaning properties, along with other oils to purify the air and protect against environmental threats. In the evenings, after dinner, I like to diffuse lavender and cedarwood to relax and calm the house. If the kids have homework/studying to do in the afternoon I like to add vetiver to the lavender and cedarwood for focus. 3 // Dyson Cordless Vacuum I LOVE this vacuum! I use it EVERY.DAY. If it ever dies I will buy it over and over again. It works great, has a lot of attachments and my kids know how to use it, too! Win/win! I have never had any issues with it and it has a ton of power. Unlike some of the other cordless vacuums, it has great suction power. Try adding a few drop of your favorite essential oil to the filter of your vacuum. When your run the vacuum it will put out a nice aroma. 4 // Flour Sack Cloths These are used in a variety of ways in my home from drying the dishes to cleaning. I love that I can throw them in the wash with hot water and bleach, too. I use these here. I have a stash in my kitchen for dishes and another in the laundry room for cleaning. They are the perfect cloth for cleaning mirrors, shower glass and stainless steel. They don’t leave any streaks. Dry the dishes and then shine up the kitchen with the same cloth! 5 // Shark Steam Mop I use this about twice a week. After vacuuming, I run this over the hardwood floors. I love it! I love that the floors are cleaned and disinfected without damaging the wood floors with water or using harsh chemicals. It dries really fast, too. I add a little essential lemon oil to the bottom of the pad (which is easily removed and thrown in the wash). When the steam comes out it adds another layer of sanitizing and the added oil makes the house smell good! 6 // Shark Press and Refresh This little tool is a lifesaver! It has a hanging pad that I keep permanently on the back of my bathroom door. While I am doing my hair and makeup I simply plug in the steamer to let it heat up. It not only steams my clothes but has a hot iron plate for pressing as it steams, too. I can steam and press at the same time. AWESOME! 7 // SQUEEGEE/Glass Cleaner I use this in different ways. I just add hot water to a small bucket, add the concentrated glass cleaner and clean quickly. It really does leave a streak-free shine. The sliding glass door and french doors are always covered in fingerprints, handprints and dog slobber. I also use for shower doors. We have a really large glass shower door in the master bathroom. These little tools make cleaning them quick and easy! 8 // Silicone Sponge Finally! A sponge that doesn’t fall apart or stink! Throw it in the dishwasher and it is like new! You can order it here. It comes in a variety of colors. They are gentle enough for veggies and fruit but can also get the big jobs done. Get a few in different colors to use for different tasks. 9 // Swiffer Dusters OK….these are such an amazing invention. Something so simple. No chemicals to spray. Unlike a feather or other duster, they grab and hold onto the dust so there are no particles flying around. Really great for those who have sensitivities to dust! I love how easily they are to replace, too. Two of my favorite ways to use them are on the baseboards and on the iron balusters on the stairs. It is always amazing to me how much dust they accumulate so quickly! Also available at the grocery store. 10 // Isopropyl Alcohol I use this all of the time!! I use it for shining up mirrors or shower glass. It is useful around the toilets, too, as it is an antiseptic and a disinfectant. Simply pick up a few bottles at the grocery store. Pull a sprayer out from an empty cleaning bottle, wash it and just attach it directly to the alcohol bottle itself. Don’t use it on your quartz counters, though. The particles are so small that the counter will absorb them and you could actually make your counters absorb the dirt. I know this because this happened to me. Our white countertops were very dingy after a short while.and this is why! Enjoy these tips! I am hoping you were able to gain something useful and, if you can’t tell, I am a huge fan of Amazon! If you have a useful tip you would like to share with us all please comment below! Hey! Love these tips. But for some reason the links don’t work! Hi, Heather! I went in and corrected the links. Thanks for letting me know they weren’t working! Have a great Wednesday!